Public procurement is a huge business. Nearly one-fifth of the EU’s €13 trillion gross domestic product consists of the bloc’s public procurement. The EU public procurement rules regulate how public bodies spend public money, through purchases of goods, services and works. The aim behind these rules is to guarantee equal access to and fair competition for public contracts within the EU market. The European Parliament recently adopted a revised package of procurement measures in the form of three new directives that will replace the current Utilities and Public Sector Directives and introduce a directive on concession contracts. The new EU rules that have been in gradual shaping for the past four years constitute a major reform of the current regime that will see procurement going fully electronic. Contracting authorities are required to make procurement documents freely available by electronic means. It will also be mandatory to submit notices in electronic form and electronic procurement, including all communication and submission must be fully in place by 2018. While retaining the basic principles of fair competition and transparency, the reform seeks to ensure better quality and value for money for contracting authorities and attempts to make it easier for small and medium-sized firms to bid. A greater degree of flexibility is being promoted to enable the bidding process for public contracts to be quicker, less costly, and less bureaucratic, enabling suppliers to compete more effectively. Public authorities will be able to run procurement exercises faster and with a greater focus on getting the right supplier and the best tender. At the heart of the new procurement rules is the concept of legal certainty. The new procurement package attempts to remedy varying domestic regulations and judicial interpretations of national courts by codifying decisions of the Court of Justice of the European Union (CJEU) in relation to the modification of existing contracts. The directives clarify the circumstances where contracts can be modified subsequent to their execution. In particular, provisions defining permitted low value modifications have been introduced. One of the most significant changes introduced by the new directives is that contracts may only be awarded based on the most economically advantageous tender. By having this as the sole criterion in the award procedure, public authorities will be able to put their emphasis not only on price. Award criteria will also be allowed to include environmental considerations, social aspects, innovation, and conditions for commercialisation. Organisational strength, experience or qualification of the staff delivering the contract may be used where this has a significant impact on the performance of the contract. The new criteria will therefore put an end to the rule of the lowest price, making quality the central issue. Another important change seeks to clarify and extend the grounds for exclusion of candidates and tenderers. Contracting authorities will be entitled to exclude economic operators that have shown significant or persistent deficiencies in performing prior contracts and bidders that do not comply with, or has violated, applicable obligations under EU or national law in the field of social, labour and environmental, law provisions. The directives establish more SME-friendly measures to promote the participation of SMEs in procurement procedures. The bidding procedure for smaller companies will be simpler, with a standard European Single Procurement Document based on self-declarations. Only the winning bidder will have to provide original documentation. The new rules also encourage the division of contracts into lots to make it easier for smaller firms to bid or establish a turnover cap limited to no more than twice the contract value that will facilitate the participation of SMEs. The revised directives provide for two new procedures by which to procure public contracts: the “competitive procedure with negotiation”; and the “innovation partnership” procedure. The competitive procedure with negotiation will be available for purchases of designs or innovative solutions but no negotiation of final tenders may be carried out. 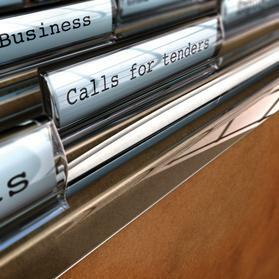 Innovation partnerships available to utilities and public sectors will allow public authorities to call for tenders to solve a specific problem without pre-empting the solution, thus leaving room for negotiations between the authority and the bidding companies to find the most appropriate answer. The new directives are expected to enter into force in the month of March. Each member state has two years to transpose the new rules into national law. Once implemented, the rules will only affect procurement exercises commenced after the date when the new national rules take effect.